Cardinals QB Carson Palmer looked sharp in Arizona’s fourth game of the preseason, opening the game’s scoring on the first play of the second quarter to John Brown, who hauled in two receiving touchdowns in the game. Falcons fans did see Julio Jones in a limited role but no Devonta Freeman in the contest, while QB Matt Ryan finished a sloppy performance with just 36 passing yards, an interception on just 4-of-11 passing. A late James Summers touchdown punch kept the Cardinals ahead even after a long Josh Magee touchdown reception from Matt Simms, for a 24-14 victory for Arizona. With that. 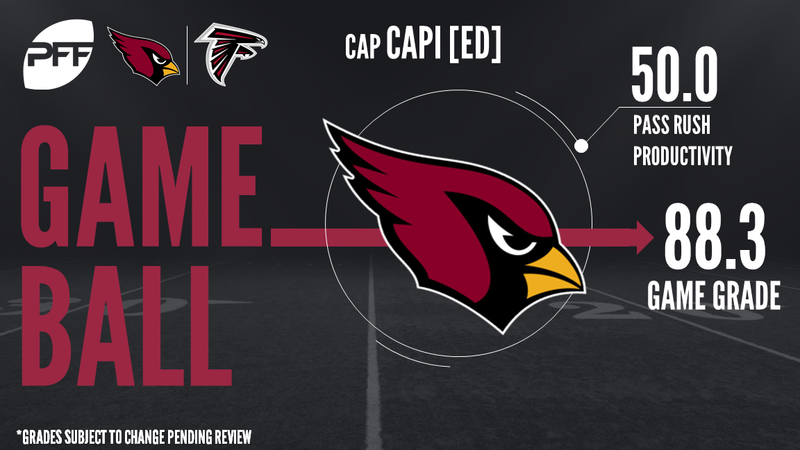 we give you our PFF exclusive takeaways from the contest for each team. With David Johnson only playing two snaps in the game, Chris Johnson got some extended work with the first team, and really let himself down by losing the handle on the football a couple of times, and dropping a pass to really compound things. Johnson bounced back a little bit with a couple of nice cuts on zone runs, but by then the damage had been done, and a veteran of his experience will be disappointed that his fundamentals let him down. Brown was only targeted twice, but both of them went for touchdowns, including an extremely tough grab deep down the left side against tight coverage. Brown’s two catches were impressive plays and showed the kind of dangerous big-play weapon he can be for this offense. Capi built upon his already outstanding preseason thus far Saturday night. Capi was again great pressuring the quarterback totaling six pressures (two sacks, two hits and two hurries) for an 88.6 pass rushing grade. He was also solid in run defense totaling an 80.7 run defense grade. Through four preseason games Capi has totaled 15 pressures and has been the Cardinals’ best pass-rusher. Williams was also solid rushing the passer, but he did it from the interior of the defensive line. Williams was responsible for three total pressures, which earned him a pass-rushing grade of 82.3. Williams also had a solid run-defense grade of 70.9 and had one run stop. While it was not a spectacular night for the Falcons offensively, their star offensive lineman came to play in Mack. Although he only played 18 total snaps, Mack showed why the Atlanta outside zone running scheme has been so effective with him at center. Mack was too quick for interior defenders and did a good job sealing them off for a run blocking grade of 78.5. Magee was responsible for one of the only highlights of the night when he showed off his unbelievable speed, taking a screen pass 57 yards to the end zone. It would be the Falcons’ only touchdown of the night in their new stadium. For a brief period in this game, Crawford transformed into Reggie White, shooting repeatedly into the backfield as a pass-rusher and against the run, and making a bigger impact than any other defender on the field. Crawford notched a sack and four defensive stops in total, and was consistently too much to handle for the Cardinals’ blockers across his 23 snaps. Allen was thrown at three times in the game when he was in primary coverage. None of those passes were caught, and he actively broke up all three of them, with one pass breakup, but a pair of hits to dislodge the ball and prevent a reception, including in the end zone to ensure TE Jermaine Gresham couldn’t come down with a score for the Cardinals offense.